Tess Mitchell would love to give her regards to Broadway, but so far that plan isn’t working out. 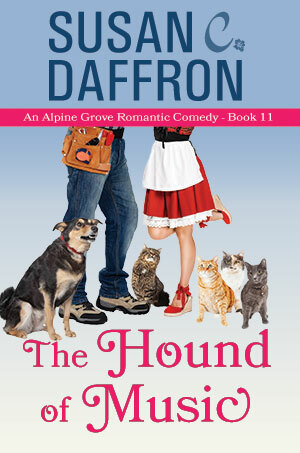 After bungling countless auditions, Tess returns to her home town of Alpine Grove where her only fans are her cats: John, Paul, George, and Ringo. Although selling advertising may not satisfy her thespian aspirations, it pays the rent—if only she could find a place willing to accept the Fab Four. While careening down a dirt road, Tess almost slams into a massive road grader. The driver is none other than Luke Bennett with his dog Barney riding shotgun. Tess hasn’t spoken to Luke since he broke her best friend’s heart, but in a small town, you always seem to run into the last person you want to see. Luke has a solution to her housing problem if Tess is willing to put up with a few inconveniences like squirrel-obsessed squatters who have cut holes in the walls. When Tess learns that the beloved Grove Theater is destined for the wrecking ball, she joins the crusade to preserve the historic icon. While working to save the theater, Tess learns more about Luke and the talents he’s forsaken. Could saving the theater salvage both of their dreams for the future?